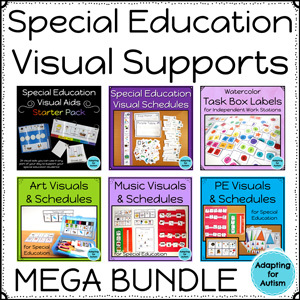 Community based instruction is so important for special education students, but these trips can put fear into the heart of the best life skills teacher. 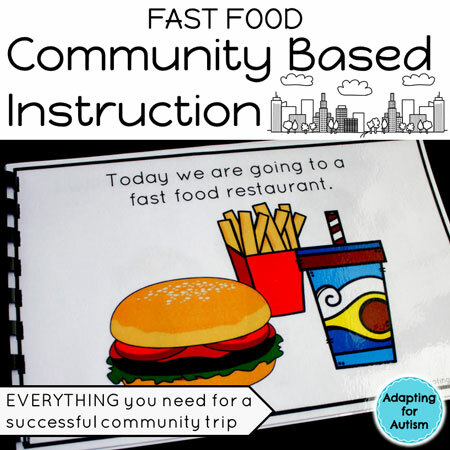 Some of my most successful community trips were to fast food restaurants. When new students would start in the middle of the semester, I would try to make their first trip to Burger King. Food is highly reinforcing so I took advantage of that to create a positive association with the community icon on their schedules (and me – I became “that lady who takes me for fries”). But that doesn’t mean I didn’t have a few rough trips. However, much like our students, I took those terrible trips and learned something for the next trip. Growth mindset! If you’re afraid of going into the community for fear of negative student behaviors, please stick with me. I’ve been there. I’m almost certain I’ve had a trip as terrible as you’re imagining. But we all survived! And we were better for it! I took one of my classes to Burger King for a community trip. In our fast food trips, students get to pick one item because we’re out in the morning and they practically go straight to lunch when we get back to school. 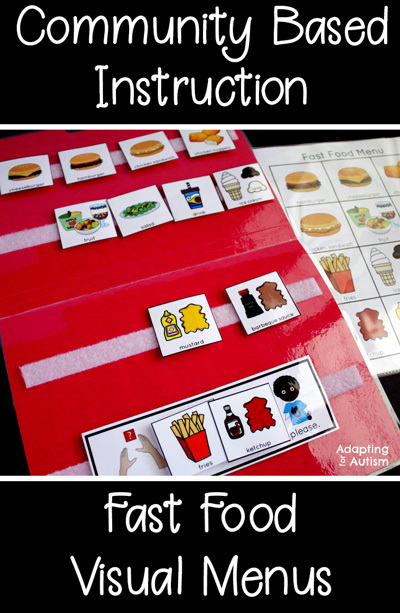 Plus, we’re there to practice tasks like waiting in line and ordering. We don’t need a full meal to work on these goals. One of my girls has a dietary restriction so her options were fries with ketchup or a plain hamburger patty with ketchup. And in the 3 years I had her, she picked fries EVERY . SINGLE . TIME. This trip was the first we took with her new class. I told the new teacher and paras that we put both options on the menu when she orders but she will pick fries. We get up to the counter and I pull out the visual menu and clear as day she tells the cashier “I want a hamburger please.” After I nearly fall over, I ask her if she is sure. She says yes. I point to the menu with her two choices and ask again if she wants fries or hamburger. She says hamburger. I physically hold out the two icons and say you want a hamburger today and no fries? She says yes. At this point the cashier looks at me like I’m crazy. Or maybe she thinks I’m a terrible person for not honoring her incredibly polite order request. So I say ok and then after she goes to her seat, I also order fries. When we get to the seat, I hold out both options and say “Do you want fries or hamburger?” I’m convinced every time I ask that she’s going to change her mind and pick the fries that I’ve seen her eat a dozen times. So she eats her hamburger with a smile on her face. Then it happens. Her hamburger is gone and she asks for fries. We tell her she chose hamburger today and she cannot have fries. All of the negative behaviors this student has ever exhibited come out. She’s screaming, kicking, SIB, throwing things on the floor, etc. We’re officially making a scene. Thankfully everyone else was finished so we were able to quickly end the trip and start moving to the bus. Well, transitions are also not a strong point for this student. Through some physical prompting we are able to make it to the bus without getting run over and then we hit disaster number 2. Getting her bus harness on. It took nearly 10 minutes and 5 staff to try to wrestle that thing on (by this time she was just fighting us and refusing to cooperate, but not actually hurting herself or others which is our criteria for a physical hold). After finally get her safely in her seat, we all took deep breaths, wiped off the sweat and shared a smile. We survived. So what did we learn? Would we do something different next time? Frankly, no. We set expectations and then we stick to them. I gave her multiple opportunities to change her mind. But I also need her to know her words matter. If she makes a choice, well, that is her choice. She was very familiar with our one-item routine because she had done this trip over a dozen times with me. We had visuals stating she could pick one item. If I gave her the fries after she started her tantrum, I would have reinforced screaming and kicking as an appropriate way to get what she wants. In addition to making our future trips even harder, we’d be doing a disservice to her family. We have the staff to say no and ride it out. Her mom may not have that ability. But we can’t just put it all on her. I had an idea this would go south. I could have prepared a better exit strategy. I could have had a preferred activity to distract her as soon as her food was done. 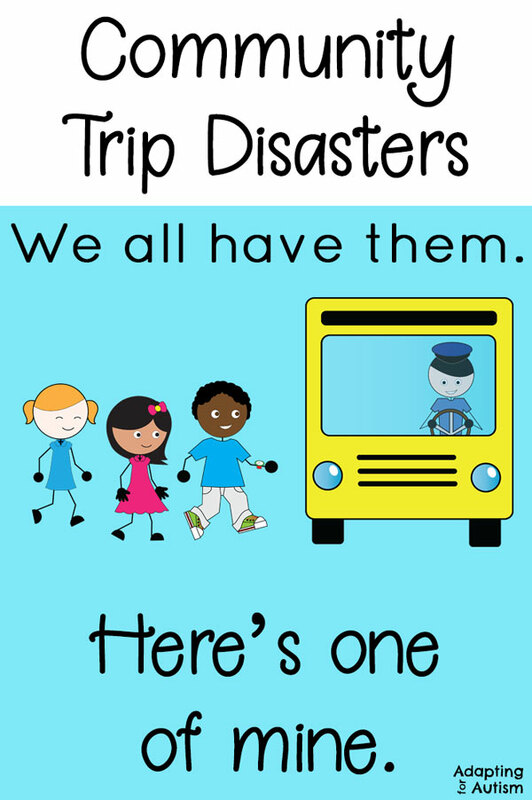 While we never want to take choices away from our students, I also know that some trips we were short staffed. If I didn’t feel like we could safely respond to an outburst, I wouldn’t put hamburger on the menu for her. We held our breaths the next several times we went out to eat but she never again chose a hamburger. We were ready…but…you know…we’d rather not. I have a full community based instruction unit in my Autism Work Tasks store that helped me keep our trips far less disastrous than this one. If you go into the community, check them out!